If 1% of people who read this post have a clue of whom Felix Lucero is, I will be shocked, pleasantly shocked, but shocked nonetheless. Mr. Lucero is as good an example as there is of a man who gave back to life more than it gave to him, and he performed quite extraordinary deeds under quite extraordinary circumstances. Felix Lucero was a Native American from Trinidad, Colorado. As a young man, Felix was drafted into the U.S. Army and found himself fighting in the trenches of France in World War I. After one of many battles, young Felix lay bleeding among the many dead and wounded who had been abandoned and left to die on a nameless, muddy battlefield that had fallen silent. Felix was critically injured and alone with his dying comrades. He was scared. In his physical pain and mental anguish, Felix prayed to God to spare him, and he promised his Creator that if he lived, he would commit his life to sculpting statues of Jesus Christ. God answered his prayers. Felix was rescued, recovered and returned to America. With no formal training, Felix began to fulfill his promise to God. During the Depression, Felix Lucero drifted and finally settled in Tucson, Arizona in 1938. He was homeless and lived in a cardboard shack he constructed beneath the Congress Street Bridge that crosses the Santa Cruz River. Anyone who travels on I-10 through Tucson crosses that bridge. Few of you, however know about the Garden of Gethsemane that sits beautifully, simply and solemnly at the foot of the northwest corner of the bridge hidden in a beautiful grove of trees. During Tucson’s monsoon season in late summer, the Santa Cruz can turn into a raging torrent of water that carries a large amount of trash and debris that is left behind when the water quickly recedes. Felix Lucero collected this debris to build his hovel under the bridge, and he hauled sand from the river to create his magnificent sculptures. He dragged up bed springs that provide the interior support for the table in his Last Supper sculpture. His original works were created with sand and plaster, but later were replaced with concrete to battle the elements. 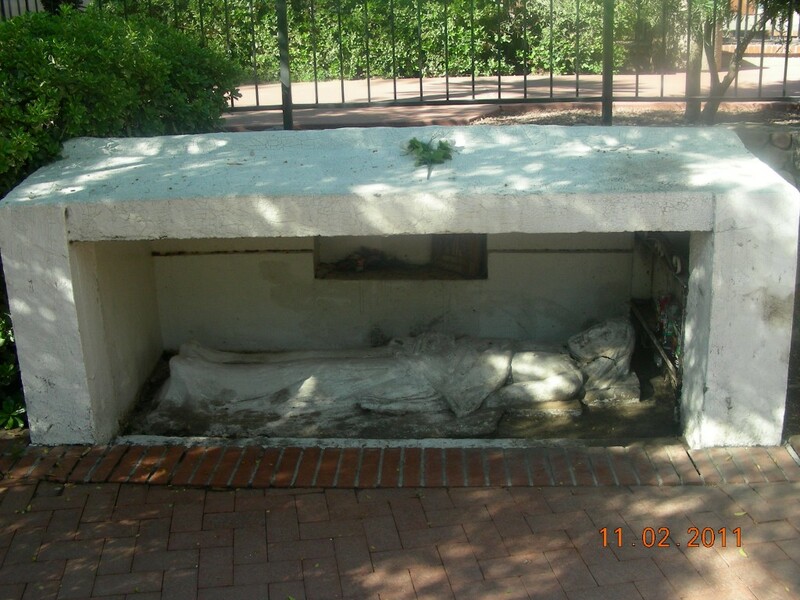 Felix simply created his work on the banks of the river next to his home for the homeless, but his work soon began attracting attention, and the site became a spot where pilgrims would come to pray and meditate. 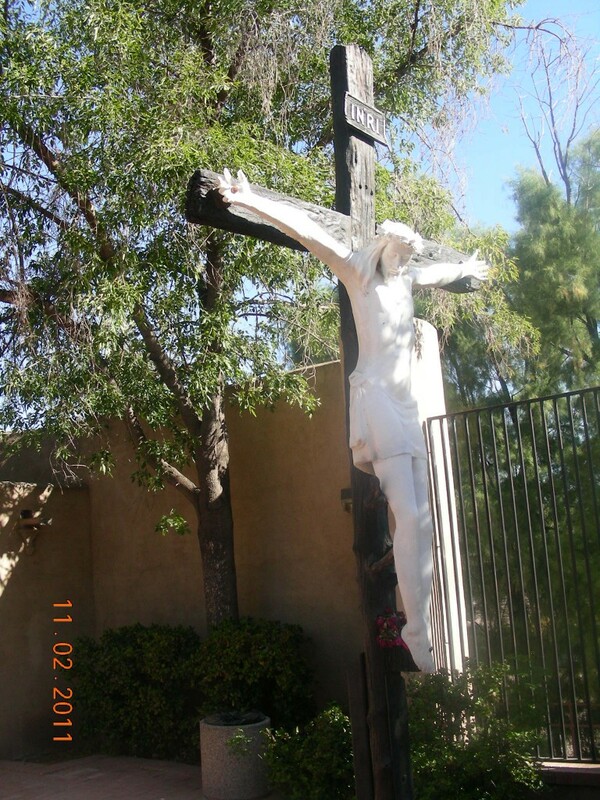 His work at Tucson’s Garden of Gethsemane was a lifelong work in progress. 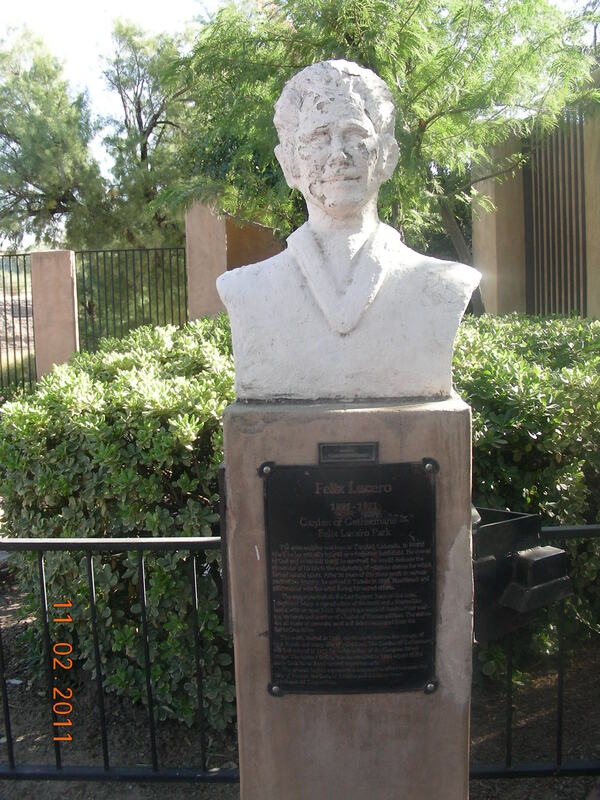 Following his death, the Knights of Columbus and later the City of Tucson have preserved the site and turned it into a park. I discovered the park yesterday on a bike ride with my wife and friends Barb and Gerry. I returned today to take some photos to share with all of you who have no knowledge of this magnificent work that a homeless man created in honor of his God. A handful of my pictures follow. If you ever pass through Tucson, I encourage you to visit this park. From I-10, exit at Congress Avenue and go west. The park is immediately on your right hidden in a beautiful grove of trees. Felix Lucero died when he was 56 years old. He died a hero because he gave back to life more than life gave to him, and he fulfilled the most important commitment he could ever make … the commitment he made to God. These pictures will speak for themselves. Arizona highways June 1988 story of Marry and William Wasson and St. Joseph retreat at Yarnell Mary located Felix in1942 her young sons helped build retreat with Felix latter one becomes a priest in mexico Fr.William Wasson(google)him. Start ophanage NPH 1980 something he brings orphans to yarnell for exucation latter one goes to art school his first commision is a statue i think of Christ at yarnell. Today he is artist and sculpture Carlos Ayala in Amthem Az. (google)Carlos D’Ayala art.all because Fr.William’s parents and 6 other couples started the Catholic Action League in 1938 and had this dream for yarnell retreat.Alsogoogle brother Barney Wasson artist lived there till he died in 2014 after the yarnell fire i just came across an ola Az.Highway mag.yesterday and read the story and had to look everyone up truly Gods Spirit at work in our lives. 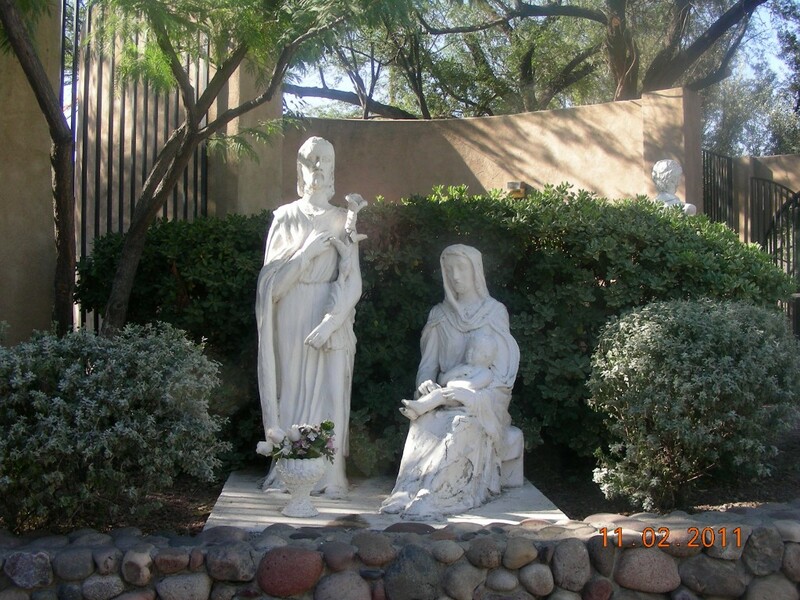 There is another site, The Shrine of St. Joseph, in Yarnell, Arizona where his great work is feature. It is a recreation of the stations of the cross. It is a perfect location for prayer, reflection and to simply admire his art. I highly encourage you to visit. I have had the pleasure, both visual and spiritual of personally visiting both of Felix Lucero’s magnificent sculptured works locations here in AZ. I wonder many times where else he may have shared his God given gifts that he so magnificently created. I have attached a link here to the location of his last known works at the Shrine of Saint Joseph of The Mountains in Yarnell, AZ. Thank you Felix, thank you so very much for sharing your gifts with the world. God bless you and keep you. Thanks for the link, Mike. Special work by a special man. When I was young and raised in Trinidad my mom told this story We are related I think he is my mothers Father or Grand father but I have to get the story right My mother is dead but i will tell you the results when I find out. Sylvia, Thanks very much for your comment. I will look forward to what you learn. Bless you and yours and have a wonderful 2013. 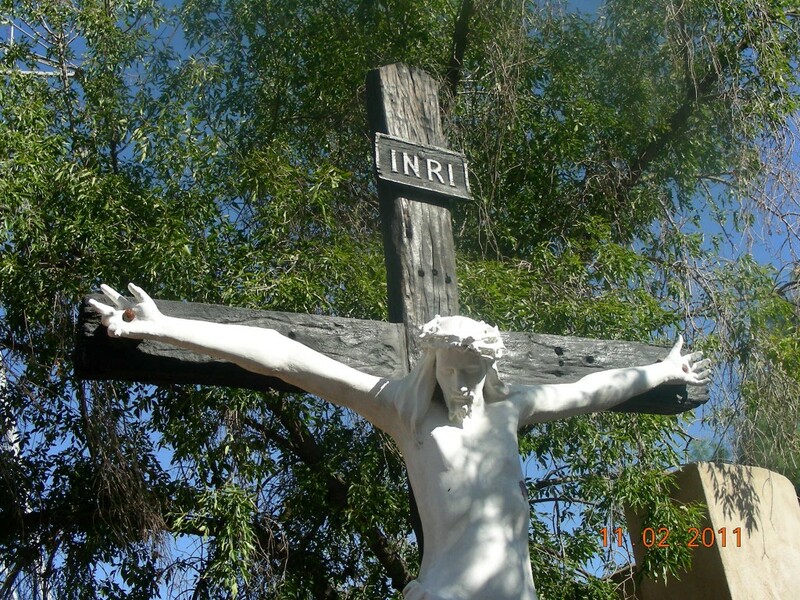 He also did the Stations of the Cross in Yarnell, AZ. What a beautiful legacy this man left. How wonderful that we have the opportunity, through you, to learn of this amazing person. Thank you, so much for writing about him. I am glad you find value in this post about Felix Lucero. I am set to wondering about that American Indian, of the misplaced, displaced culture and nation. Wondering about the circumstances between the war and his beginning his work. Seems his riverside abode was his sanctuary, perhaps in a way “close” to the Indian way, his ‘sculpting with the materials at hand’ his life’s calling, his fellow homeless his congregation. Words to tell his whole story could not tell his whole story, huh. Sad, but with freedom and courage and a promise to keep, maybe there was peace. What a beautiful tribute to and by a wonderful man. The story was so uplifting.